Dragonflies are fascinating with all their pretty colors, aren’t they? In the past, we have shared a dragonfly salt painting craft and as well as a craft stick + pipe cleaners dragonfly. This month’s kids craft star challenge is buttons. Every month a group of us collaborate on a craft challenge where we all use the same material and come up with a creative project using it. For this month’s button challenge, we are sharing an easy button dragonfly craft suitable for ages 4+. See how other’s crafted with buttons at the end of the post! 1. Glue buttons on to the craft sticks. Ours have 2 bigger ones followed by smaller ones. Let dry. 2. Glue on 2 googly eyes per dragonfly. 3. Draw wing shapes on paper or cardstock. 4. Decorate the wings. Our baby dragonfly is just patterned scrapbook paper with the edges outlined with black marker. The pink dragonfly is sprinkled with glitter (I love Martha Stewart’s fine glitter !). The brown one has a watercolor background (leftover from a different project) with purple glitter glue spread over it. 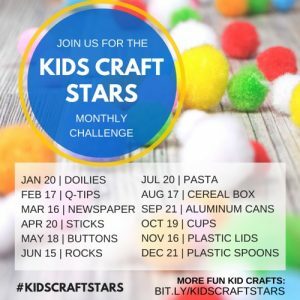 Follow the kids craft stars group board on Pinterest and use the hashtag #kidscraftstars on Instagram to join in on the craft challenge. Ready for more creative minibeasts projects like this button dragonfly craft? Check out this round up of silly snail crafts for kids! Such a cute craft that I can do with my nieces and nephews. Is there a template for the wings? Also, I’m putting together a craft book and wonder if you ever have printer friendly instructions with the picture? Thank you.